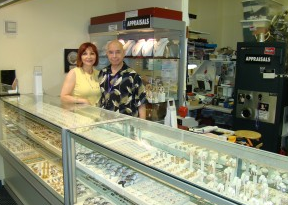 Dallas Diamond Syndicate has been in business for over 25 years. We are buyers of gold, diamonds, watches, antique and estate jewelry. We also sell diamonds of all shapes and sizes and do all your custom work. We also offer full service watch repairs and restoration - Make sure to see us in the extreme rear north west corner of The International Jewelry Exchange.